Imperial Oil is an integrated energy company, engaging in the exploration, production, refining and marketing of energy products. It is Canada’s largest refiner of petroleum products and a leading marketer of fuels, lubricants, asphalts and specialty products. By revenues, downstream constitutes 71% of total revenues, followed by upstream segment (25%) and chemicals segment (4%). Imperial has a presence in both upstream and downstream parts of the value chain. In the upstream part, Imperial owns and operates some of the best oil sands in Canada. Its Cold Lake operations is one of the largest in situ operations in the world, whereas Kearl is considered as one of Canada’s highest-quality oil sands deposits. In the downstream part, the company operates 400 kbd of refining capacity in strategically located refineries. Imperial’s Sarnia and Strathcona are amongst the largest integrated refining capacities in Canada. In addition, the company also operates a profitable polyethylene business. Imperial Oil enjoys nationwide leadership across the entire value chain. Founded in 1880, Imperial Oil has a deep experience of operating in diverse geological and geographical environments, and has witnessed several ups and down cycles in the oil industry. This long standing experience enhances the company’s resilience in combating volatile and tough times in the energy industry. Since Imperial has a presence in both upstream and downstream parts of the value chain, it is less vulnerable to volatility in the energy sector and is in a position to better capture the synergies arising through integrated manufacturing and marketing activities. Imperial operates through a well diversified asset base of upstream, downstream and chemical assets, consisting of high quality oil sand deposits, large refining capacities and an extensive pipelines network. The company is working towards increasing the annual production of its Kearl mines, Aspen in-situ project and Cold Lake expansion projects, which should drive top line growth. Its Esso and Mobil are popular brands across Canada. Popularity of Imperial products can be measured by the fact that the company manufactures and sells about one-fourth of the petroleum products used by the Canadians everyday. The company is an industry leader in research and technology, having invested more than billions in R&D over decades. It is further enhancing its portfolio by focusing on highest value assets and core competencies. Ownership of long-life, quality upstream assets, strategically positioned refineries, strong logistics, and leading brands are strong competitive advantages of Imperial. The company also stands a good chance to benefit from the rising demand of oil and gas which is estimated to increase 25% by 2040. Imperial Oil has a century old history of making consecutive dividend payments to stockholders. The company has been increasing its dividends for the last 24 years in a row. It returned more than $1 billion to shareholders through share purchases and dividends in the last year and around $2 billion this year. The company has compounded dividends at a rate of 6.5% for the last 10 years. The last dividend raise was 18.8%. Imperial also has a share buyback plan and has repurchased 50% of shares since 1995. The company further extended its buyback plan in 2017. Imperial’s upstream assets have a proved reserve life of more than three decades, generating over $17 billion in the last ten years. It is estimated that Imperial Kearl mines could alone help meet North America’s energy needs for the next four decades. The company is further targeting a 15% overall production growth through FY 2020, on the back of sustained production at Cold Lake, improved reliability at Syncrude, ramp-up of Norman Wells and supplemental crusher at Kearl. 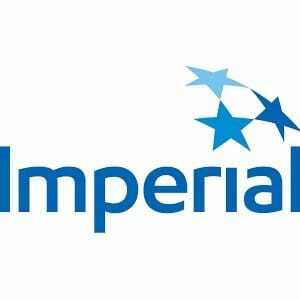 Imperial is a subsidiary of Exxon Mobil NYSE:XOM which holds a 70% stake in the company. A strong parent adds to Imperial’s financial strength and improves access to cheap capital sources. Imperial generated strong cash generation in each of the Upstream, Downstream and Chemicals businesses throughout the year. It is expecting between $1.3 billion and $1.4 billion in capital expenditure for the ongoing year. Strong technical expertise and efficient operations make it a leader in core markets of Ontario and western regions. Given the company’s sound balance sheet and strong future production projection, Imperial Oil should comfortably continue its dividend growth streak going forward. After the oil price downturn, many large energy companies like Royal Dutch Shell, Total SA and ConocoPhillips sold their oil sands deposits. Suncor Energy TSE:SU which is the largest oil producer in Canada and derives a majority of its revenues from its oil sand business is Imperial’s largest competitor. Canadian Natural Resources TSE:CNQ also holds some of the best oil sands assets in North America, particularly thermal in situ properties. Cenovus Energy TSE:CVE is a large integrated oil and gas company based in Canada. The company got a boost after the acquisition of most of ConocoPhillips’ operations in Western Canada, which almost doubled its oil sands production. Imperial Oil should leverage its leading position in the Canadian oil sands industry to benefit from the rising demand of oil and gas. The company’s large scale of operations, integration across the value chains, ownership of well-known brands and a strong parentage should allow the company to grow profitably in the future without much risk. A payout of just 25% and strong cash flows should provide enough room for future dividend growth. I would prefer to hold ExxonMobil as a long term holding but if the US dollar exchange rate is a barrier, Imperial could be a proxy but I prefer Suncor as a Canadian oil producer as it passes my Chowder Test.